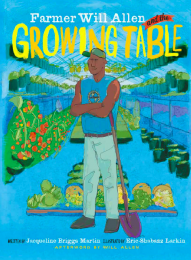 Here’s a book that should be used in conjunction with every school garden curriculum. Jacqueline Briggs Martin, whose book Snowflake Bentley won the Caldecott award, tells the story of Will Allen, the founder of Growing Power, whose vision is to build sustainable food systems that are equitable and ecologically sound, is no ordinary farmer. A former basketball star, he’s as tall as his truck, and he can hold a cabbage, or a basketball, in one hand. But what is most special about Farmer Will is that he can see what others can’t see. When he looked at an abandoned city lot he saw a huge table, big enough to feed the whole world. This book, vibrantly illustrated by Eric-Shabaz Larkin, follows Allen from his childhood where the family table was always full of great food (including his favorite lima beans with ham! ), through his professional basketball career in Belgium, to his success in bringing urban farming to Milwaukee and other cities around the world through worm-based composting, vertical gardening, aquaponics and other innovative programs. The book is published by Readers to Eaters whose mission is to promote food literacy and publish books that celebrate the pleasure of food, the joy of eating together, and the wonder of seeing our nourishment grow from the ground.